The classic cross-weave pattern of this high quality cast aluminum collection is well suited in both traditional and contemporary garden settings. 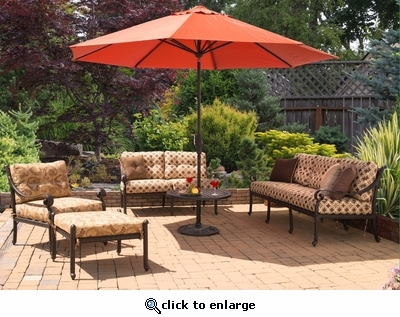 Our Lancaster Collection is a great choice for years of durable outdoor use. This rich Bronze finished cast aluminum is easy to care for and has the look of antique wrought iron at a fraction of the weight. Includes a built-in 50 lb. umbrella base to help provide pleasing shade for any outdoor seating arrangement. Table Only Umbrella not included. Light Assembly, ships in 2 boxes.